It’s going to be a mixed bag this week. Sun is shining and I am thinking diffusers, green tea and Google. Starting With The Diffusers. We have just brought in the most amazing fragrant reed diffusers by Stoneglow called Natures’s Gift. Not only do they smell divine but look the business too. So instead of the boring glass bottle in the corner you can now put them center stage in any room. 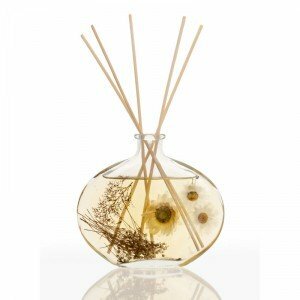 My particular favourites are Ocean Reed Diffuser and Oud And Amber Reed Diffuser. All the bottles have an art deco look about them, and are filled with shells, flowers or herbs. This week they come with an extra 10% off and free postage. Now Onto Green Tea. I try to chill out every Wednesday with a local yoga group. Lot’s of interesting people. For a start our teacher is the 70’s It Girl Kari-Ann Muller. She is the on the cover of Roxie Music’s 1972 album of the same name. Amazing woman and incredibly beautiful. She is very bendy too. Another lady in the class is Anne from Attic Teas. She has got me into Oolong Tea and Energising tea. I bought their nifty tea pot too! Feeling more clear headed and chilled out than I have in ages, so thanks Anne. Google reminds me of that carnivorous plant Audrey in the Little Shop Of Horrors, ” Feed me Seymour feed me!”. So I have bought, for light reading (hah! ), Tim Kitchen’s How To Get To The Top Of Google. Seriously, all I like doing is selling great candles and home fragrance. Sadly though if you are a small to medium size business it is not enough. So, I am now on chapter 3 and ploughing on through. Have to say it is a very easy read, even if you are a non tech like me. I will report back with progress. If you too need help with feeding the Google Monster here is a link to get Tims book. We can all compare notes at the end of the year! Click on the link ‘books’ at the bottom of his page. Older The First Christmas Candle Of 2015!